I was looking for some salad recipes for red cabbage and came across these three in my Polish recipe books. Two different methods are used to prepare the cabbage and I was intrigued to see how they would turn out. They were both a success and I will be using them again. This method is in between using raw and cooked cabbage. 1- 2 teaspoon of sugar. 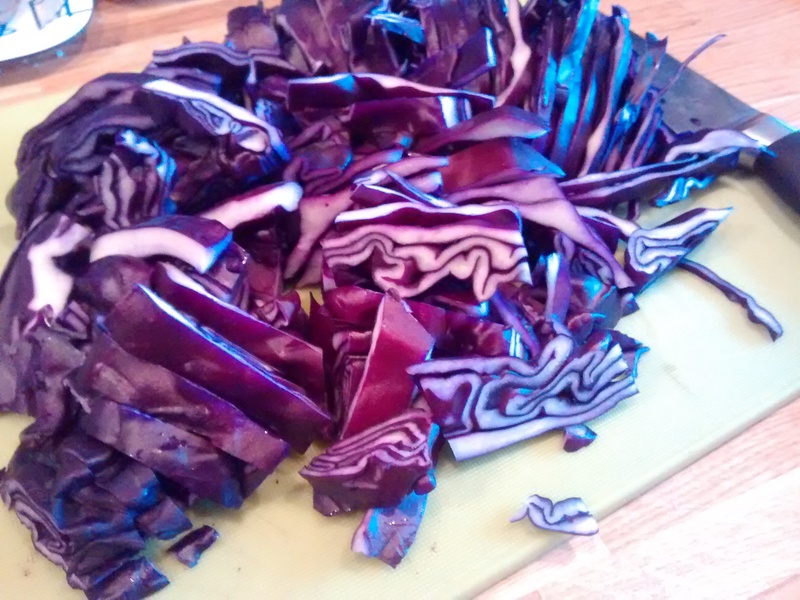 Using a sharp knife shred the cabbage into fine slices. Put the shredded cabbage into a pan and just cover with water, bring this to the boil and then let it simmer for 1 to 2 minutes – no more. Strain the cabbage from the water, pour the juice of a lemon over the cabbage and mix it in, as well as taste, this will give the cabbage a lovely colour, and leave it to cool. Note – next time I will chop into much smaller pieces. Peel and coarse grate the apple and add this to the cabbage. Chop the onion into fine pieces and add this to the cabbage. Mix in the juice of another lemon and 2 tablespoons of olive oil. Add salt & pepper and sugar to taste. This salad goes well with roast pork, goose or duck. 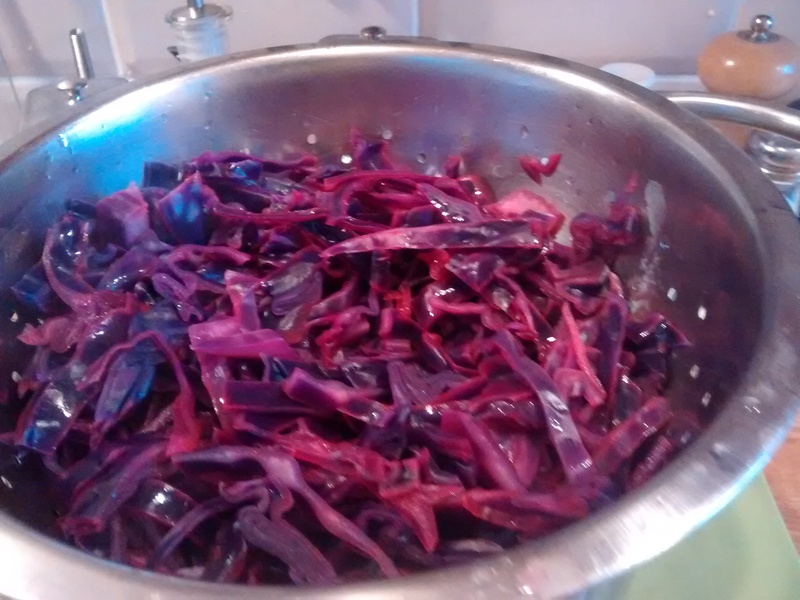 For these the cabbage is grated on a coarse grater – this was quite hard to do but well worth it. It is the dressing which makes these two salad different – both are delicious. 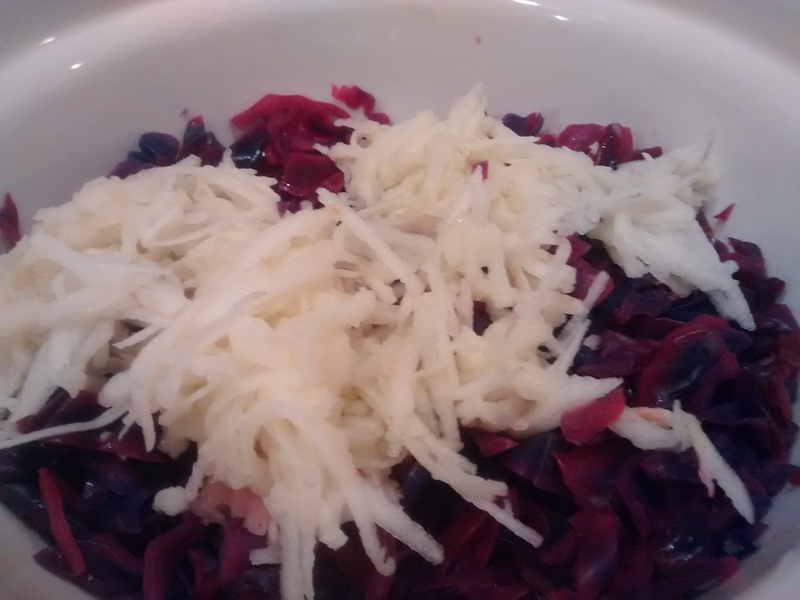 Mix the grated cabbage and apple together. Mix up all the ingredients for the dressing. Add the dressing to the salad and thoroughly mix it all together. Mix the ingredients for the dressing and pour this over the salad and mix it in. Chop the walnuts into small pieces and mix them in before serving. Walnuts (Juglans regia) are native to south-east Europe and south-west China. They are the oldest tree food known dating back to 7,000 BC. There are accounts of their cultivation in Babylon (now Iraq) in 2,000BC. Juglans regia means means Jupiter’s royal nut. They are the seed of a drupe (stone fruit) – not a true Botanical nut. In Polish walnuts are orzechy włoskie – nuts Italian – so named it is thought as they were brought to Poland by traders from Imperial Rome. Black walnuts (Juglans nigra) are native to North America.